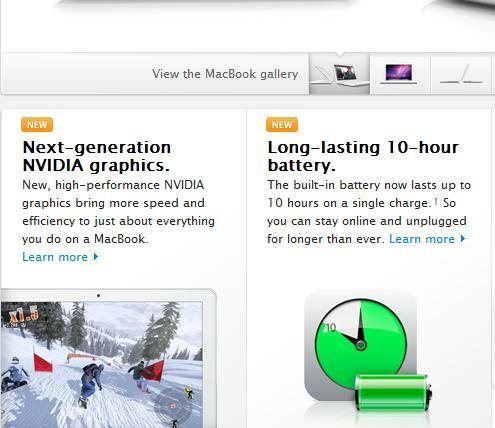 Back when rumors hit the web about an Apple laptop with 10 hours battery life, we were all skeptical. The internet has seen its share of rumors and there is no reason why this too-good-to-be-true MacBook was fiction. I was one of the skeptics. Now I am glad I was wrong. Yes, the 10-hour battery time MacBook is indeed real. Not only is it real but it is also available for ordering from Apple’s site in Hong Kong, Germany, and Taiwan. Other countries will be able to order the new MacBook soon. The laptop comes with a 2.4GHz Core 2 Duo processor and with NVIDIA GeForce 320M graphics. The older version of this new model had a battery life of 7 hours, an already impressive figure. But the new MacBook’s 10 hour battery really goes the extra mile. A previous MacBook Pro with the same specifications and a 13” screen is currently available for $1199. Priced at only $999, this new MacBook is a winner over the mentioned MacBook Pro. Click here to visit Apple’s page for the new MacBook. Pingback: iPhone 4G Leak, Pre-order Available in Hong Kong?